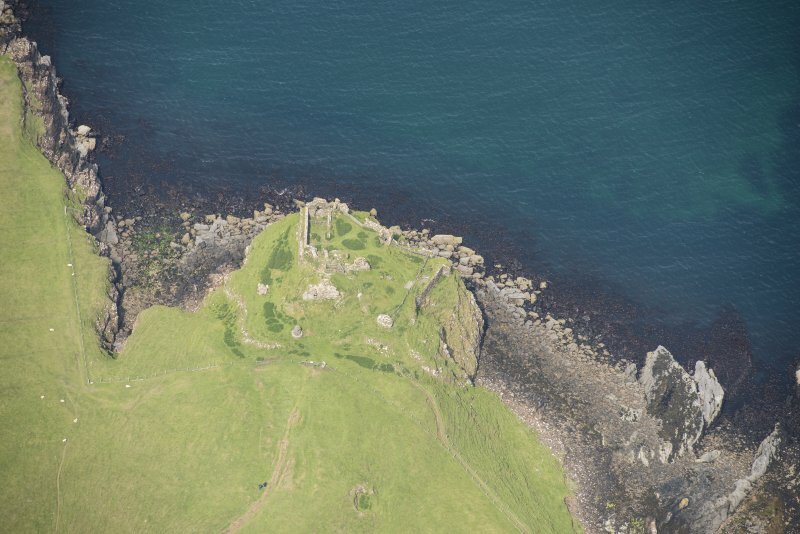 Skye, Duntulm Castle. Seagate from inside. 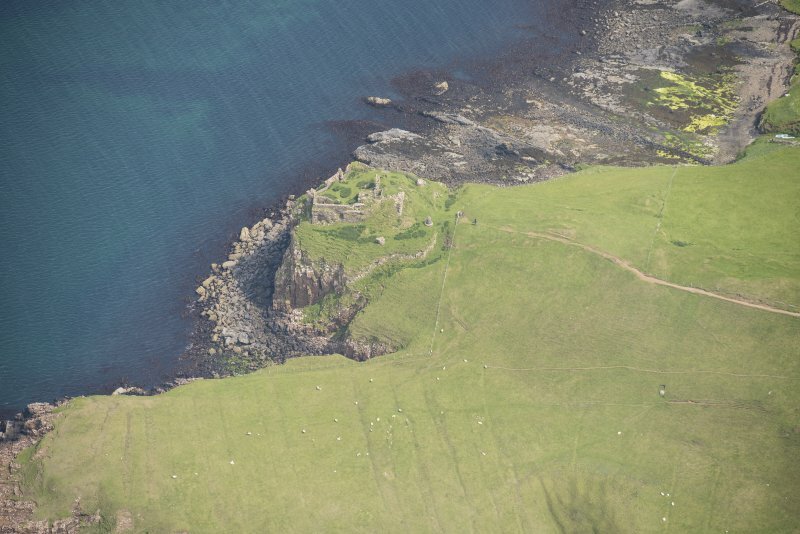 Skye, Duntulm Castle. Detail of later tower; vaulted chamber with pointed window, facing north west. 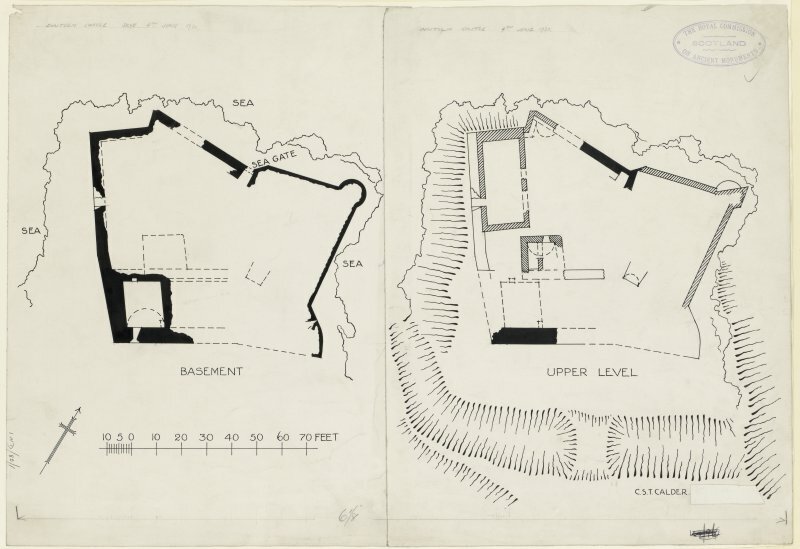 Publication drawings of Duntulm Castle, surveyed 4th June 1921. 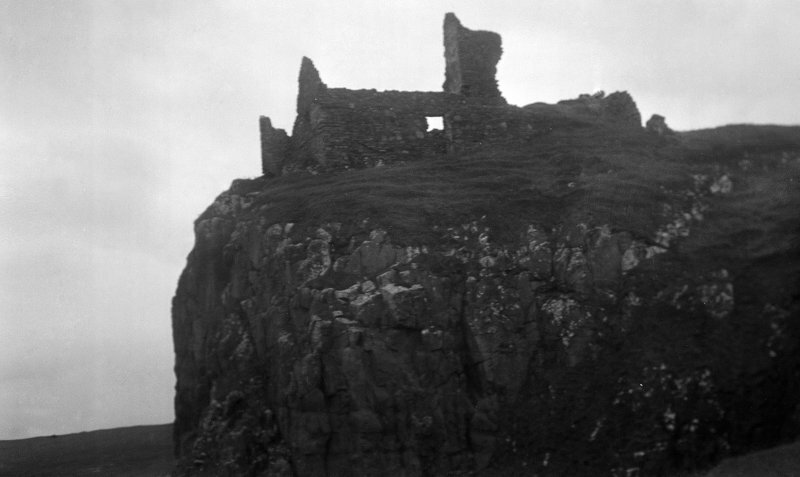 Skye, Duntulm Castle. General view from the south. 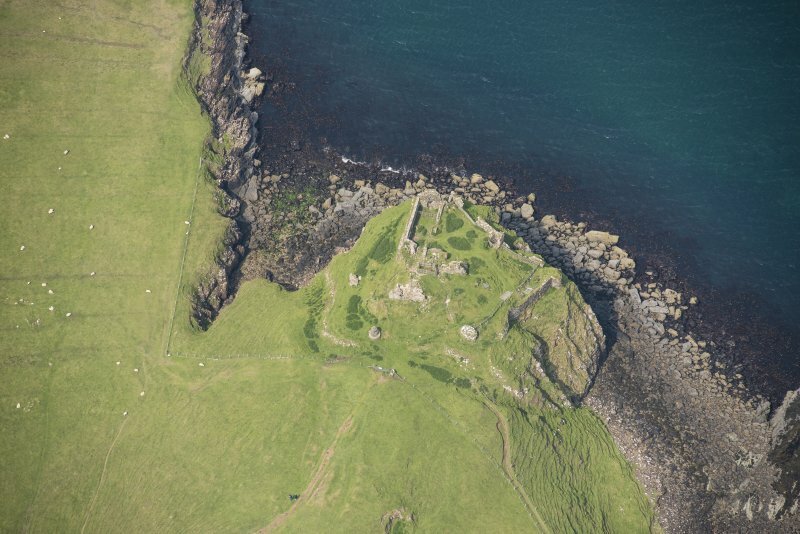 General view of Duntulm Castle Skye, facing north east. 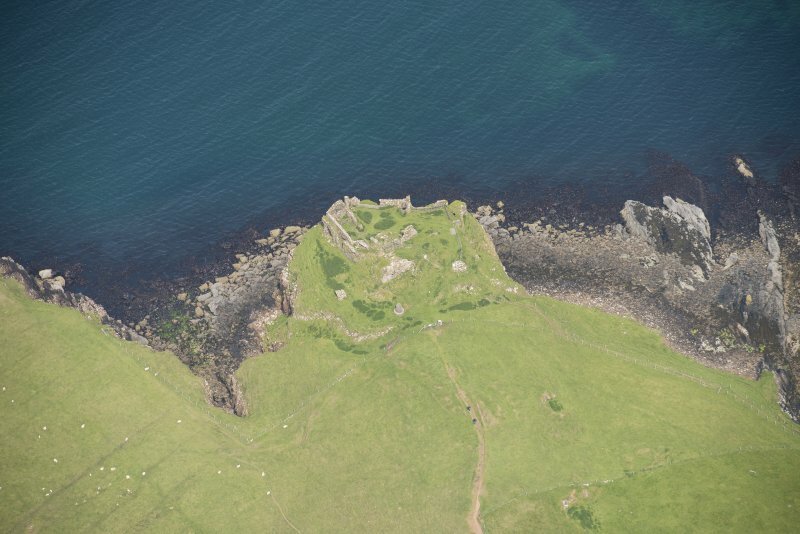 Skye, Duntulm Castle. General view from South West. Historic photograph. General view from W.
Duntulm Castle, 14 /15th century with subsequent additions Now a much eroded and stone-robbed ruin, sea-girt and defended to landward by a wide ditch. 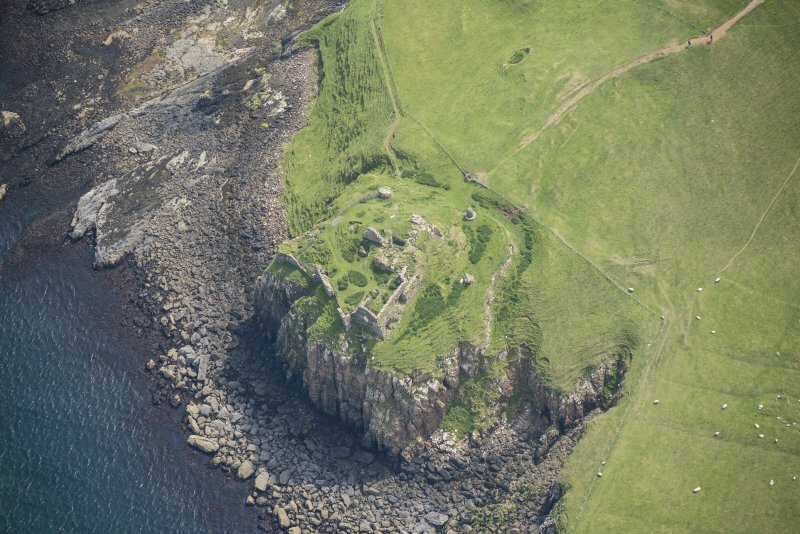 It surmounts an outcrop of pillared basalt on which, in prehistoric times, a broch or dun -Dun Dhaibhidh (David's fort) -is believed to have stood. The late medieval curtain wall of irregular plan was contemporary with a four-storey tower to the landward side, only the vaulted cellar of which survives. The curtain was remodelled in the 16th century when the castle's defences were updated. Abutting the tower immediately to its north, another tower was added, probably as part of the early 17th century renovations (a good section of its wall collapsed as recently as 1990). Duntulm's ascendency as the symbol of Macdonald patrimony peaked around 1650. The original tower was embellished at parapet level and a new rectangular structure erected to the north-west of the enclosure. 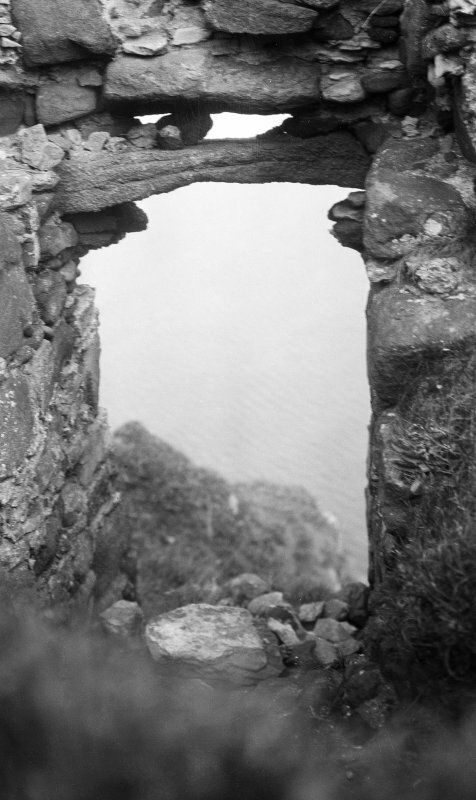 The only surviving evidence of an entrance is on the seaward side, giving acces to a cleft in the cliff edge which leads down to the sea. 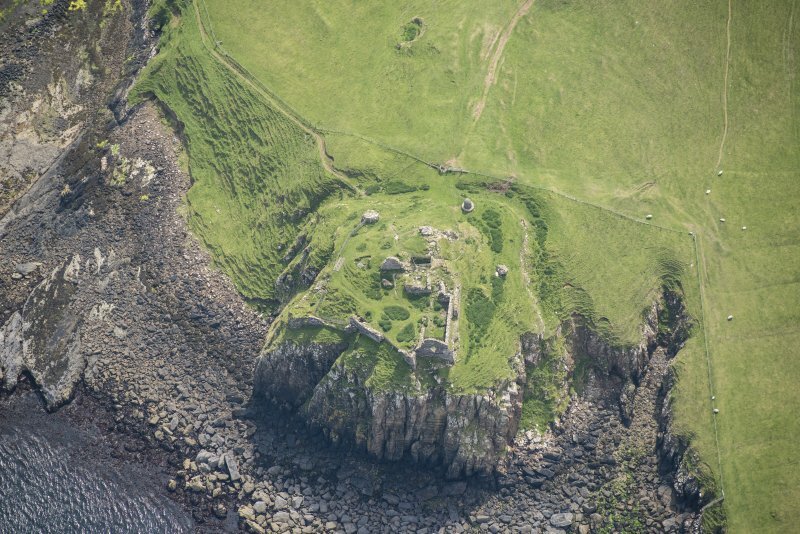 Duntulm Castle, the later seat of the Macdonalds of Sleat, stands on a quadrangular site 50' above the level of the sea, and has cliffs sinking steeply to the sea on three sides, while the fourth or landward approach slopes downward to a dry ditch cut through rock and earth. Midway a broad track crosses at nearly outside level, but this seems to have been formed in late times for convenience of approach. The depth of the ditch varies, but at some parts, where least worn down, is from 10'- 15'. The principal structure of 15th century date, about 82' in length and 30' in breadth, lies athwart the site fronting the ditch, and from the buildings screen walls return, closely following the cliff edge, and enclosure an area, irregular in shape, of about 800 square yards; the interior level of the enclosure is very irregular and there are indications of vaulted substructures, in places built against the outer wall, over nearly the whole of it. A small 17th century tower has been added to the main block, with which it communicated, and projects within the courtyard. Beyond the tower in the NW corner of the enclosure is a later house 34' in length and 15' in breadth within walls 2' 2" thick. The walls of the enciente vary considerably in thickness. The NE angle of the enclosure is a projecting bastion circular on the lower part, the upper part being angular. The E angle of the main block is aldo an angular bastion. The building throughout is in the local basaltic rubble, some of which is much weather-worn. It is in a very bad condition and much of it has fallen within recent years (RCAHMS 1928). Historical Note: The earliest reference to Duntulm is by Munro (M Martin 1934) in 1549 where it is noted as 'the castell of Donntwyline pertaining to Donald Gromsone'. 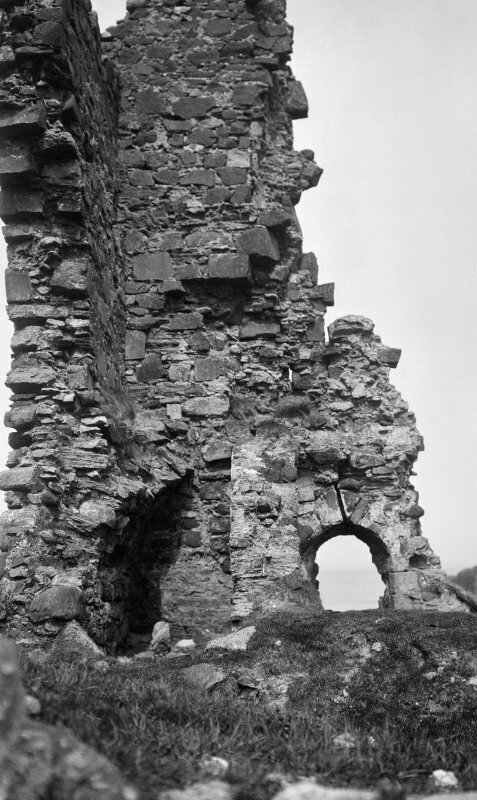 Another reference to Duntulm, dated by Skene (1886-90) to the late 16th century, notes it as a ruin; in 1617 the Privy Council required Sir Donald Macdonald of Sleat to make it his seat and if the present buildings were not suitable to build or rebuild. 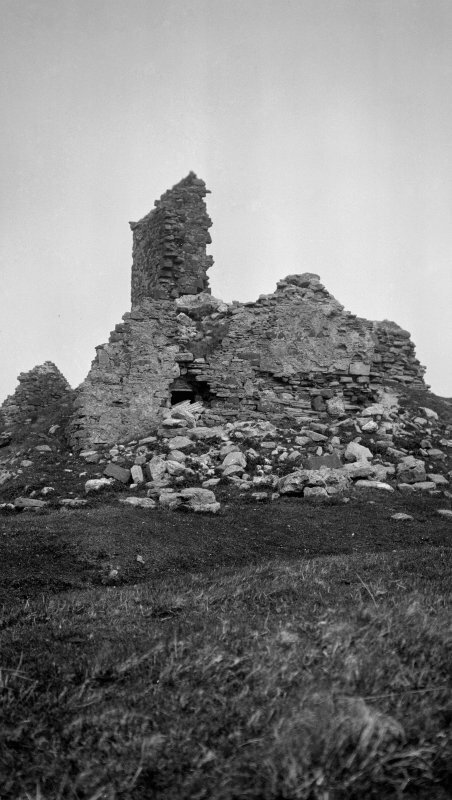 (The ancient seat of the Sleat Macdonalds or Clan Husdein had been Dun Scaich: NG51SE 1 - RCAHMS 1928, No 599). In or about 1732 Duntulm was abandoned in favour of Monkstadt House (NG36NE 7) the castle providing material for the rebuilding of that place. The traditional predecessor of this castle was Dun David, or Dun Dhaibhidh. 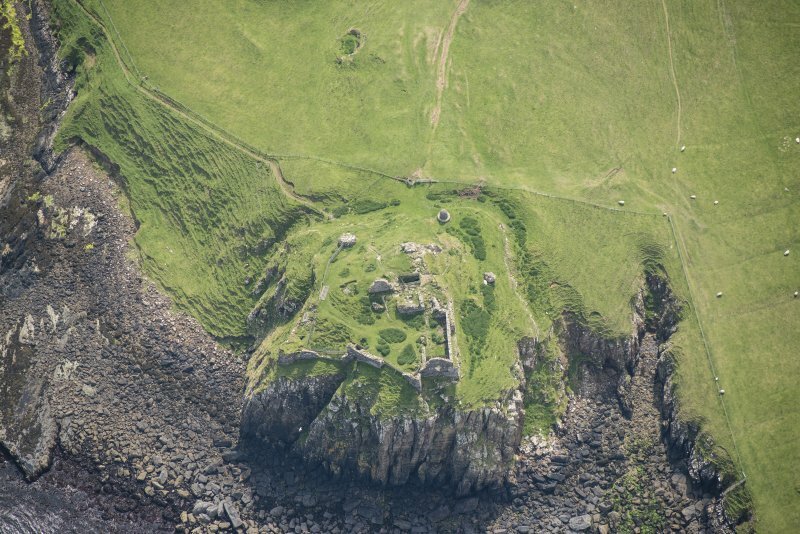 RCAHMS refer to it thus:- "Dun David, now the site of the ruins of Duntulm Castle. Martin (1934) names a Dun David but does not specify it further". 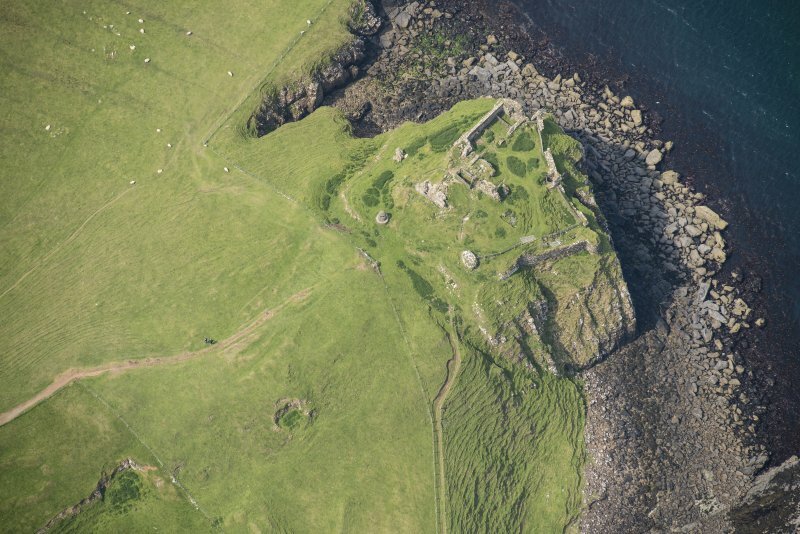 On his map Duntulm Castle and Dunvegan Castle are given their own names. W F Skene 1886-90; RCAHMS 1928; M Martin 1934; J Macintyre 1938; S Gordon 1950. 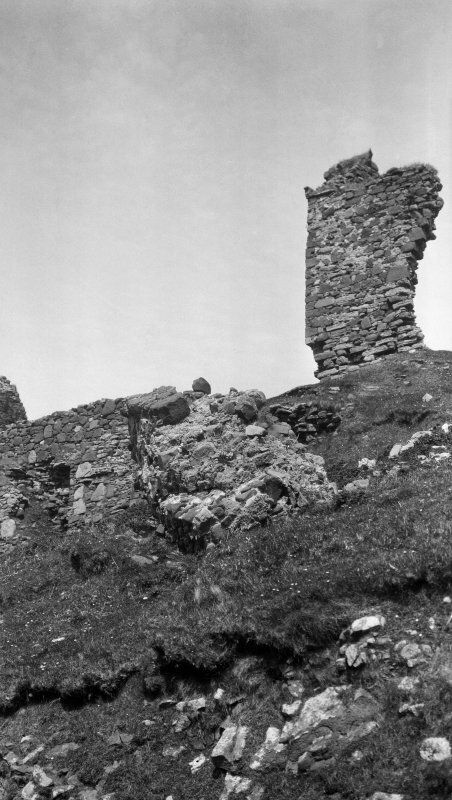 Duntulm Castle: as described above but in poor condition. No trace of the supposed Dun David was found. Cutting showing photograph of a portrait of Sir Alexander Macdonald of Sleat with Duntulm Castle in the background. Non-Guardianship Sites Plan Collection, DC23446. 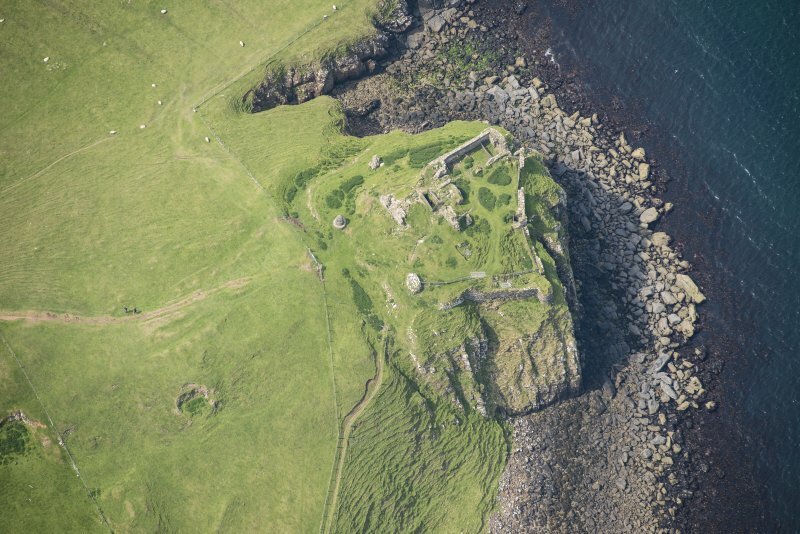 There has probably been a defensive structure on the site of the castle at Duntulm for centuries, but the ruined buildings which now stand there have obliterated any traces of an earlier fortress. 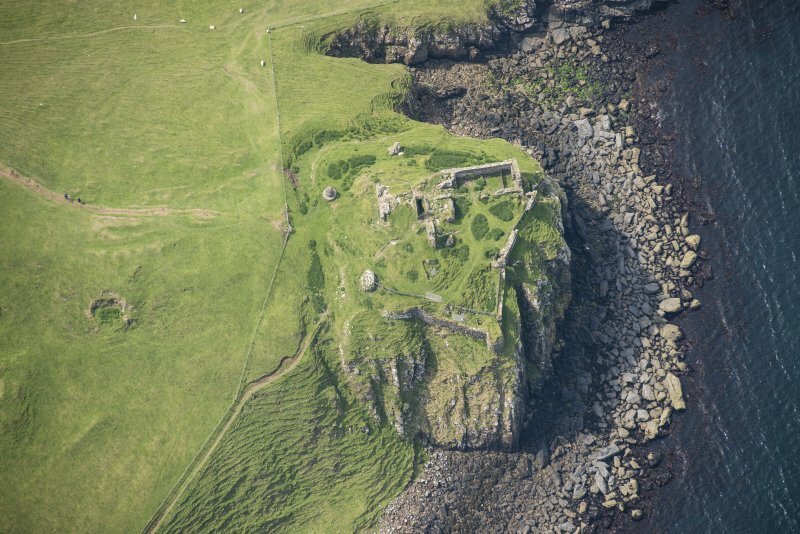 The lands of Trotternish were the subject of rival claims by the MacLeods of Dunvegan and the MacDonalds of SIeat, and it was probably to consolidate their possession that the MacDonalds moved to Duntulm from Dun Scaich (no. 24) in the early 17th century. 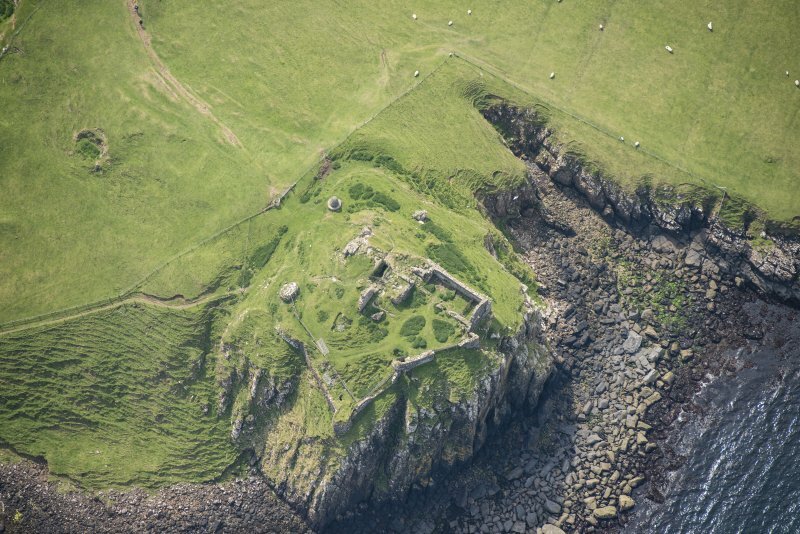 King James V visited the castle in 1540 and is said to have been favourably impressed by its strength and hospitality, but in the early 17th century Sir Donald MacDonald improved it as a dwelling. It was abandoned about 1730 when the family went to live at Monkstadt, a little further south. 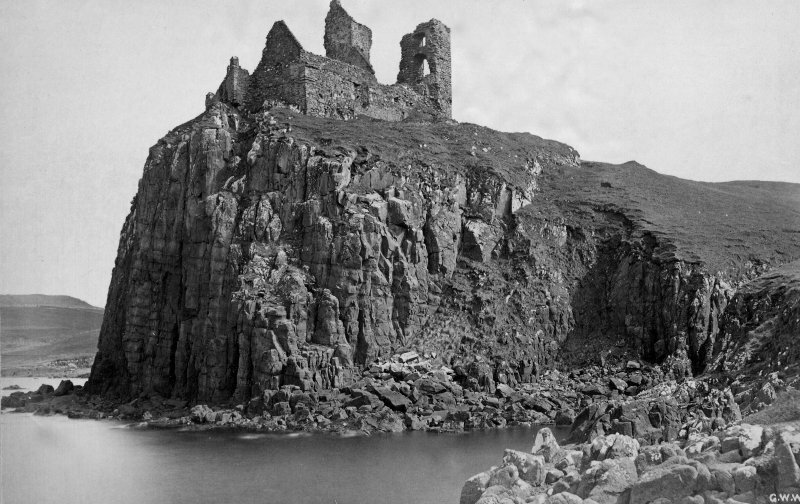 The castle stands on a crag, with cliffs and steep slopes on three sides and a dry ditch on the fourth. The earliest surviving structure is a rectangular building facing the ditch, with a wall enclosing the summit of the rock. Very little of this earliest building remains, though there is a barrel-vaulted basement at the southwest corner. The main entrance was across the ditch, but there is also a sea-gate in the wall on the opposite side of the courtyard. A small tower with a vaulted room on the ground floor was added in the 17th century and parts of this tower still stand to the full height. Another building was added in the north-west corner of the courtyard. Among those who died in the dungeon here was Hugh MacDonald, cousin of Don aid Gorm, the 8th chief He had plotted to supplant Donald Gorm but the plan miscarried and, after hiding in Dun an Sticir, North Uist (no. 57) for some time, Hugh was captured and left in the dungeon at Duntulm with a plate of salt beef and an empty pitcher.